Designer kids clothing is usually higher quality, has better longevity and without a doubt offers more fashionable styles. It is considered expensive clothing pieces made of luxurious fabrics and labeled with a branded name. Some parents prefer to buy designer kids clothes because of their lifestyle and higher disposable income. Others spend more on kids clothing because of their philosophy ‘quality over quantity.’ However, most parents choose to style their children with luxury kids clothing when they are looking for something super trendy, stylish and exclusive. Whether it is a rose, beige, light blue or cream; these trendy colors will brighten your summer days! You can match pastel colors well with lace summer dresses for casual events. Natural colors can be easily coordinated with anything from shoes to jackets. It makes buying luxurious kids clothing worth over time. Most luxury kids clothes brands use high-quality fabrics like silk, cotton, and linen. Those materials are light, comfortable, and durable. High-quality fabrics and decor determine the luxurious texture and longevity of designer kids clothing. Many styles this season have lace, ribbons or embroideries for a fashionable high-end design. 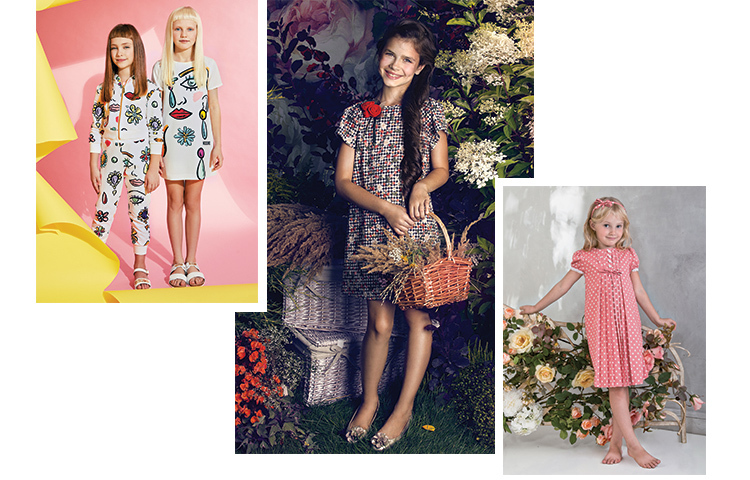 Dress to impress by dressing up your little girl this summer in bold prints such as floral, damask or classic polka dots. For a casual day out, floral prints are trendy and add a sweet personality to her Little’s look. For a special occasion, make sure the bold print design you choose is appropriate. And remember that one outfit must have only one print design to pair with a bright color for a clean and consistent look. Many little girls’ dream is to wear puffy dresses and skirts to dance around. Tulle skirts are hot this season. 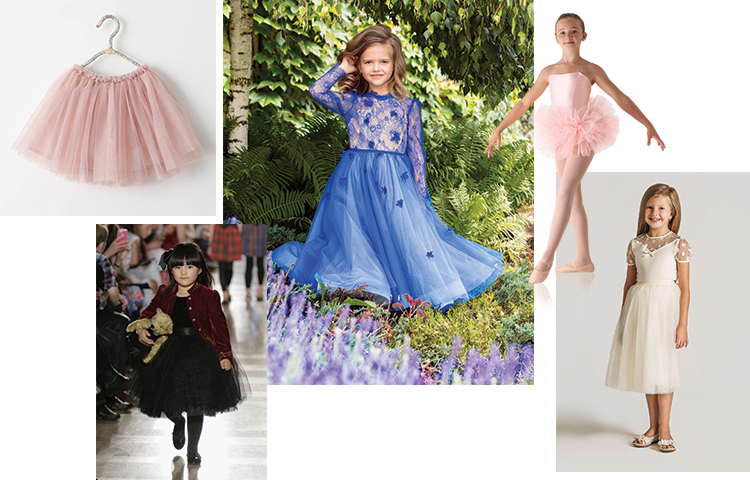 Let your little girl prance around anywhere in a bright color tulle skirt. For a stylish look, you can pair it with a simple white t-shirt. Ruffles are classic and timeless for a sweet and sophisticated look. A casual way to wear ruffles is the trendy off the shoulder neckline. A ruffled skirt can flare out your little girls’ style for any special occasion. Luxury kids clothes feature not only bold prints but also bold colors this season. Metallics usually comes in gold, silver, and copper. The shiny bright colors will show off the luxurious lifestyle. 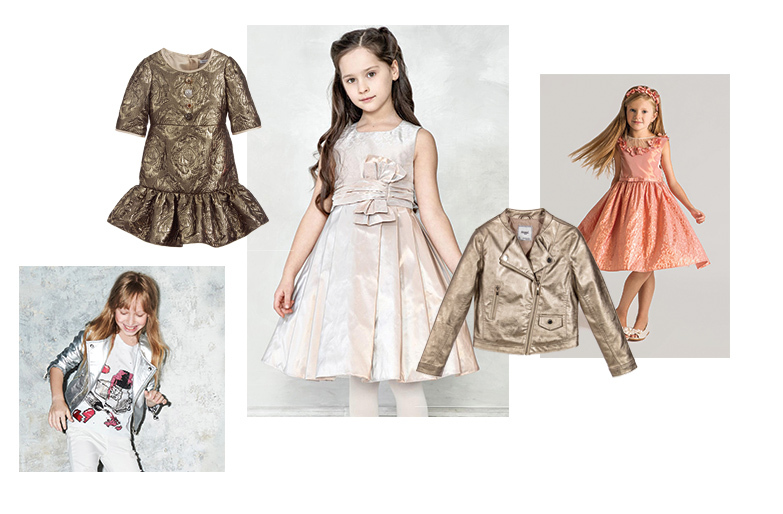 Add a metallic jacket to any outfit or dress you plan your little girl to wear, or let your little girl shine through with a bold metallic top. Designer clothes for children can spice up any dull little girls dress or outfit with a dash of sparkles. A perfect way to add sparkles to her dress is, for example, to have sparkles on tulle skirts. You can balance such sparkly skirt with a plain bright color top. Now you are aware of the latest girls fashion trends; you can put together a stylish outfit for your little. Get creative and mix and match different designer clothes together. Pick a gorgeous dress for your little girl and layer other clothing pieces together such as jackets, vests or cardigans, add cool socks or accessories … and your little fashionista is ready to rock! 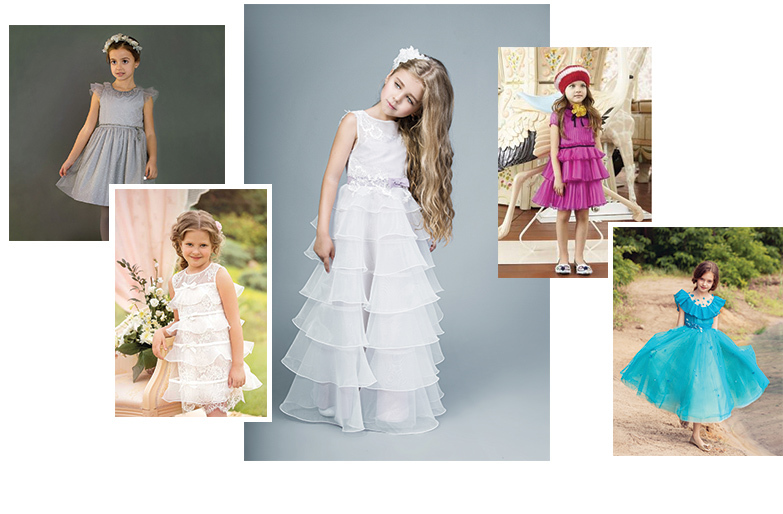 Papilio Kids offers a great selection of chic flower girls and special occasion dresses. Following the latest kids fashion trends of the industry, Papilio designers create unique styles for little fashionistas to wear on an extraordinary day, whether it is your girl’s birthday, your sister’s wedding, christening, etc. Fabrics and materials are carefully selected. 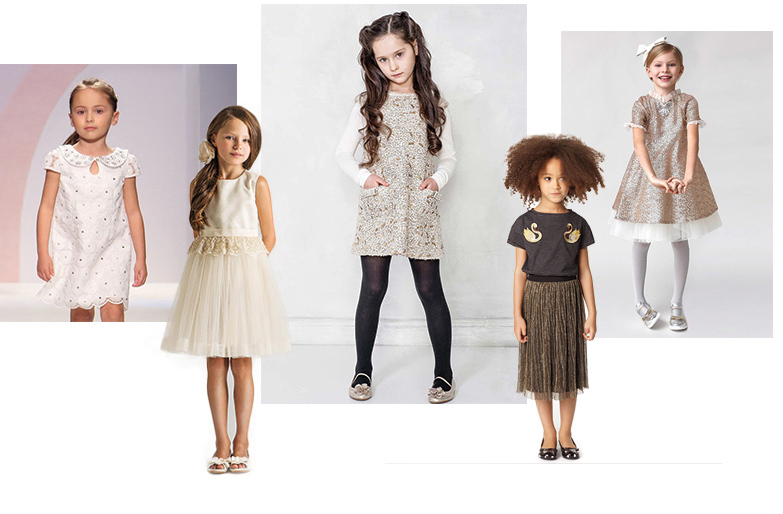 Papilio girls dresses and outfits are gorgeous but at the same time light and comfy to wear. 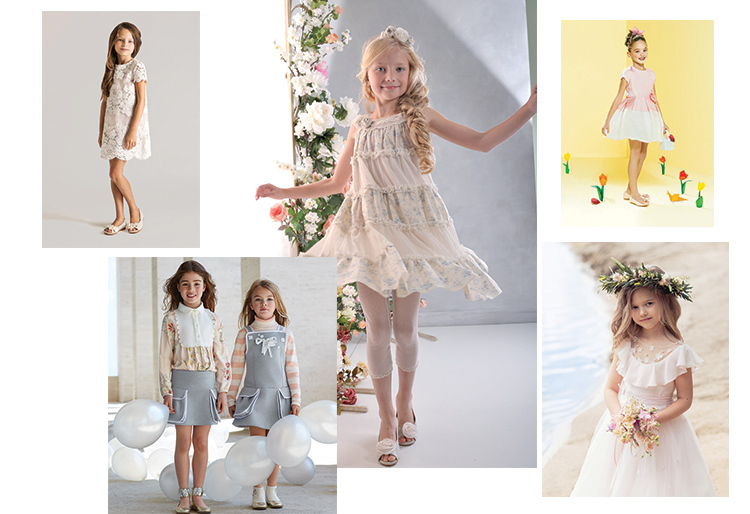 Get inspired and check the latest collections available in Papilio Kids online boutique.